Once you have completed a treatment and a list of scenes, you are ready to start writing the script proper. A script is basically a series of descriptions, actions, and dialogue exchanges. Compared to writing a novel, there is little pressure to create a sense of flow between scenes or carry the reader away with your prose. Few people read scripts simply for pleasure anyway. A script's job is to provide the filmmakers with everything they need to do their job. That said, your chances of inspiring someone to make a movie out of your script will depend to a large extent on how well you set up your scenes and create pace, rhythm and movement throughout, as well as how punchy and persuasive your dialogue is. A script should involve the reader and make it easy for them to imagine the kind of movie that could be made out of it. What it shouldn't do is include material that cannot be directly communicated by images. Take this example: "He sat on the bed, brooding darkly. His eyes burned with rage. In his gut a desire for revenge was stirring that could not be denied, that would not be denied. He would find her, and he would kill her." This reads like a passable pulp novel, perhaps; but such prose has no place in a screenplay, for the very obvious reason that none of this can be conveyed through simple images. All we have is a man sitting on a bed, presumably in a less than joyous frame of mind. On the other hand: "A man sits on the bed. He is in his early twenties, unshaven, with dark hair, wearing white shorts and a T-shirt. He smokes a cigarette and gazes out of the window. He sighs and holds his head in his hands, looks at his cigarette. With a determined expression, he takes the cigarette and brings it to the flesh of his other arm, wincing in pain as the flesh begins to burn." There is nothing here that an actor can't perform and that doesn't give a director room to interpret in his own fashion. And however the scene is shot, it is going to communicate the fact of a man in despair, being driven to commit an act of violence. In the first case, the purple prose gives little or no indication how these emotional states are going to be conveyed to a movie audience. In the second it is quite clear. As a scriptwriter you should always imagine your story in visual terms and tell it that way, i.e., describe what you see when you picture the scenes unfolding on the screen. Watch out for too many shot descriptions, such as "CLOSE UP on the young man's eyes as we hear the sound of burning flesh," and so forth. Though there may be times when this is necessary to convey mood, most of the time things like shots, music, camera movements, and suchlike, are decisions the director will want to make, and should not be dictated by overly specific script instructions. As a general rule, give only information you consider strictly necessary to make the movie. Physical description of characters and locations, camera moves and shots, characters' emotional states and body movements, line delivery, and such things, being not strictly necessary, will tend to weigh your script down. A script is a blueprint for a movie, and anything that is superfluous probably won't be used anyway. There is a fine line, however, between streamline descriptions and threadbare prose. 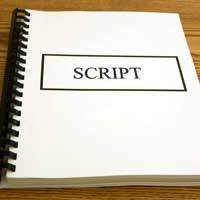 Although a script is not a novel, it is not a computer manual either. Be sure that every page is imbued with the spirit you consider the essence of your story. Beyond this, where a script really needs to express your voice is in the dialogue. Dialogue is the one part of your job that has a chance of getting to the screen as you write it. Dialogue is also what any prospective actor is looking at first. Be sure it is not only original and exciting, that it comes off the page and grabs the reader with its authenticity, but also that it is the kind of dialogue actors can sink their teeth into. Don't put words in your characters' mouths; that's the surest way to turn them into dummies. Let them talk to you. Give them room within the scene to come off track and circle around the subject and find their own way to it. Don't be afraid to write more dialogue than the scene has room for, then pare it down to its essence. This is the simplest way to find out what it strictly necessary, and ensure the dialogue be economical and not overly explicit, i.e., true to life. Much of what goes on between people is what's left unsaid. It's in the pauses and silences and body language, things the actors will bring to your writing, but only if you give them room to do so. Many, many thanks for the crafting of this scientific and auspicious art form of creativity*** you are hitting the nail"s head*** keep on keeping on*** Life for ever*** light Born Brian.